My cousin Binh and I met when I first came back to Vietnam for the first time in 2000. He was about 8 and I was about 21. When Binh was little, he survived a tragic accident causing his head to split open. Luckily, nothing bad happened to him except everyone says he is very quiet and keeps himself to himself, except when I come back, he only ever talks to me. This time, he showed me how he makes creme caramel because he is setting up a little street stall outside the house. In a parallel universe, I happened to be playing around with creme caramel in London for the supper club at the same time he started to experiment with recipes. We both had a strong miss and craving for the creme caramel you can get in both our mother's home town of Phan Thiet - 5 hours away from Saigon. In Phan Thiet, there lives a poet and teacher, named, Duong (Uncle) Tran, after school every day, he would open up his garden which is at the front of his house, turns on the fairy lights hanging from a jack fruit tree, opens the gates and people flood inside for tea, coffee and creme caramel, the best creme caramel in the world! I always have to visit this place every time I go to Vietnam. Its a must! Duong Tran doesn't talk much, especially about what goes into his famous dessert. He refuses to disclose any information on how he makes it. (I don't blame him) He lost his wife, his muse, who always loved his kem flan, and tells us that that he will make this everyday so that she can also enjoy it in the afterlife. The Vietnamese love creme caramel, one of the things bought over by the French colony. 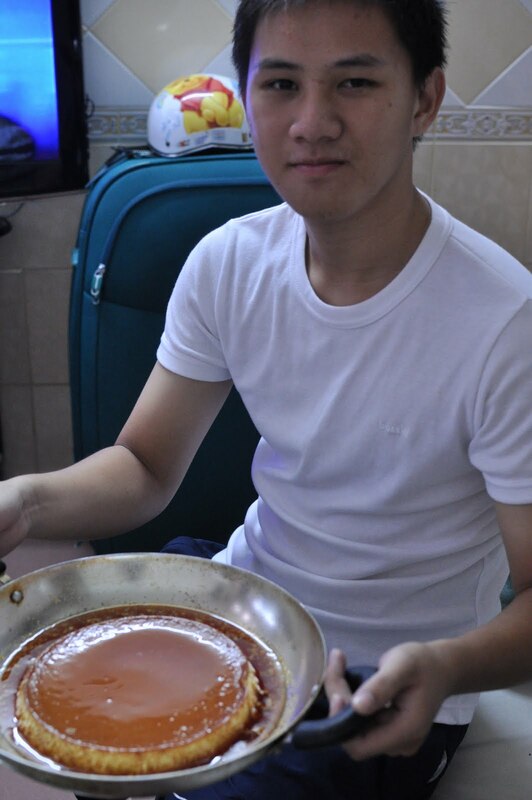 In Vietnam, they do not really have ovens, so if you were to recreate it, it is usually steamed. Goodness knows how Duong Tran makes it to utter perfection of sweetness, edginess, lightness and delightfulness. Here is Binh's recipe which is very close to Duong Tran's. Not too many people have ovens in Vietnam, so this is steamed over a bowl in a pot of water for 30 mins, but this leaves many holes in the custard. For the caramel, I use coffee instead of water for a difference. It makes it taste subtly of coffee as it is only at the base in the caramel which is great for evening desserts as you shouldn't really drink coffee so late. I have experimented with many variations and found this combination to be rather good. You will need 20 - 24 remekins or 2 large oven proof dishes. You can also use any oven proof dish in different sizes to contain the custard so long as its about an inch in depth. -Pre heat the oven to 160C. -Gather all the ingredients together and mix it all up in a big bowl, making sure everything is blended in well. -Caramelise the sugar by adding it to the coffee in a pan, stir at first to dissolve the sugar and leave to bubble up for about 15 mins. The caramel should be of a thick in consistency like treacle. You may have to do this twice if its not enough to fill all your remekins. -Once the caramel is ready, pour a thin layer onto the remekins quickly, making sure all the surface is covered at the bottom and along the sides. Leave to set hard. If it doesn't set, then you should take it out with a spatula and reheat the caramel. Normally, you can see when its ready as the sugar turns brown, but when you use coffee, its brown from the start. -Pour the creme mixture into the bowls with a ladle. -Place the bowls into a large baking tray and fill the sides with boiling water (bain-marie). -Bake for 20 - 25 mins. -Once time is up, take the pots out and leave to cool and then refrigerate for at least 6 hours or overnight. I love this stuff so much, it is hard to take a picture before digging in. -To serve, loosen the custard with a thin knife around the sides, turn the remekin upside down, tap out the baked creme caramel onto a plate. The caramel should drizzle down the sides, forming a coffee puddle around the baked custard. -In Vietnam, this seems to be OK sitting in hot weather as hardly anyone has fridges on the market stall/ street and they serve it with crushed ice on top.